HAPPY RELEASE DAY TO SARA SHEPARD! 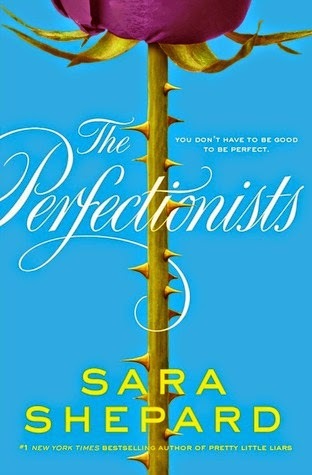 THE PERFECTIONIST IS OUT IN BOOKSTORES TODAY! Today we share our very first read-along on Good Choice Reading. This is my first time participating in one, and I have to say that I am pretty excited about it, and happy that HarperTeen & Me, My Shelf and I asked to be a part of this event. HarperTeen is also offering an amazing giveaway for our GCReaders. The giveaway will run all month long with plenty of chances to win! Let me start with that this is my first book by Sara Shepard. I know, I know, where have I been? I wasn't a big contemporary reader. It wasn't until about a year ago that I really got into the genre. Of course now I can't get enough. One thing that really sticks out to me most is how easy the writing seems. Not only did Shepard do a great job jumping right into the story, but also introducing each character, and giving just enough information for you to prepare for what is to come. Normally I don't like books with too many main characters in the spotlight, but I think because the book is written in third person it's a lot easier for me to follow. Each chapter features one of the girls, and takes you into their history with Nolan Hotchkiss. He is one bad boy... tsk, tsk, tsk. Or should I say was one bad boy? He hurt a lot of people and it's pretty sad what some of these girls have gone through. So far I really like all five girls. They each have a unique voice and don't all blend together. In the little I've read there is plenty of mystery, and the girls have definitely found themselves in a tough spot. They don't know whether to speak up and share the truth, since technically they didn't kill Nolan, or just wait and see how it all plays out? It's an interesting read so far, and I cannot wait to dive right back into it! I hope you stop by next week and join us again for the next couple of chapters! Things are getting good! On the morning of Nov 6th Sara Shepard will be chatting with the read-along hosts and YOU! Stay tuned for an exact time and hashtag, to be released soon! This giveaway is sponsored by HarperCollins. Winner will be announced on October 31st. Winner has 48 hours to claim prize, or else a new winner will be chosen. Thanks for reading along this week with MMSAI and the other blogs! I love the dark secrets and the shocking twists. It sounds like a wonderful murder mystery. Thanks for having the giveaway. My students would really like this book.